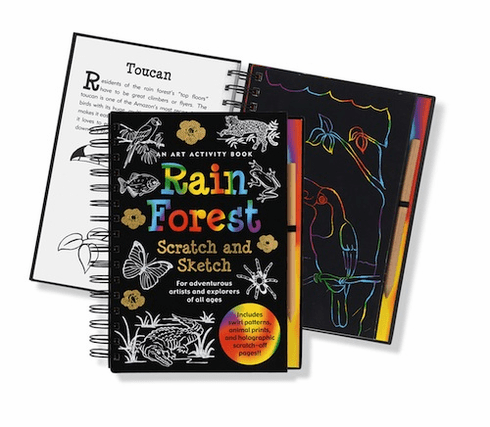 Create your very own rain forest, scratching all the way! Where can you find the world's most colorful birds, the slowest creature, the most ferocious fish, and the stinkiest flower? The rain forest, of course! Explore the dark and damp forest floor, swing from tree to tree, and look out from the highest perch as you get creative with the handy wooden stylus, copying 20 sketches of rain forest life. Learn about exotic creatures, from the giant armadillo to the green tree frog. Just scratch away the black coating, and discover the wildlife and swirl patterns and holographic colors that appear in your artwork like magic. Ages 8 and up. Shrink-wrapped with a wooden stylus for drawing on black-coated paper to reveal colors beneath. 64 pages. Includes 20 scratch-off, 20 illustrated, 20 sketch pages. 6-3/8" wide x 8-1/2" high; wire-o bound hardcover.